We use recyclable material that attaches naturally to almost any surface without glue. It can be removed and reused multiple times. We are in a process to finalize a series of Stattys videos, also in English. Coming soon. In our Rolling Planning Calendar you can visualize your tasks and milestones with whiteboard marker (dry erasable) or Stattys Notes of coming months. Adjust to show the time span of 3 to 12 or more months. Looking for impulses and support for your strategy development and business model? 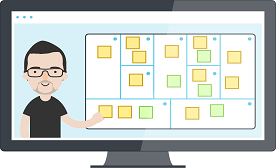 Strategyzer offers online and offline courses and coaching for an innovation sprint. You can find the Strategyzer tools here.